Format: Alamo Draft House 35mm. Temp inside theater, near that of the Antaric, to simulate penguin life. The march of the penguins, sounds about as interesting as I think just about anything else that you might find on Animal Planet. Some really love animals, and might watch Animal Planet 24/7 but overall it is a low ratings channel…So a documentary about Emperor Penguins walking, doesn't really seem to be that interesting. At least not 48.6 million dollars interesting. But that is how much it has made so far since it's release. 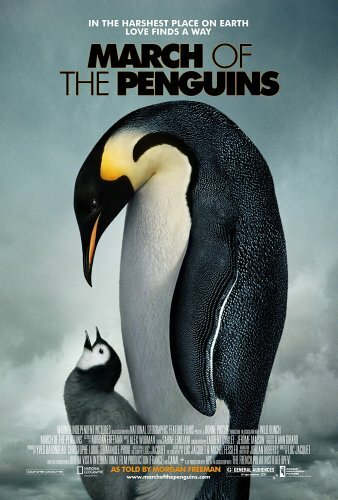 To put it simply this movie and the story of these penguins is amazing. An unbelievable tale about the life and travels of the Emperor Penguins, Male and Female, in order to find a mate, and have a baby, and then to raise that baby until it too can begin the march. Along with this great story comes wonderful footage from the harshest place on earth, where it was up to -80 degrees or more, not couting the wind. Winter storms, and no sun for weeks or longer. It was narrared by [tag]Morgan Freeman[/tag], and he told the story with truth and caring that propelled the story along just when it needed it, and was not over wordy or taking away for the visual story being told. The penguins were superstars, truly working thier craft in front of the camera. A more real actor than any actor could have been. Showing feelings that were real, and touching our hearts like no actor ever could. Adding humor and fear, and pain, to this story of love and being together, making things work no matter how hard it got, really was a story that people could understand across the world. I would say, one might actually want to wait for this one on DVD however. As we left wondering. Wondering a lot, having questions, and not more movie to answer them, we suspect there to be more information on the DVD. Perhaps even more footage, as the movie was a bit short at 85 minutes. It is a hard one to pick DVD vs Theater, as the visual feeling this movie portrays really should be seen in the best possible format, which is in the theater. I would go with seeing it in the theater now, and buying it on DVD when it comes out, that is what we will be doing I am sure.